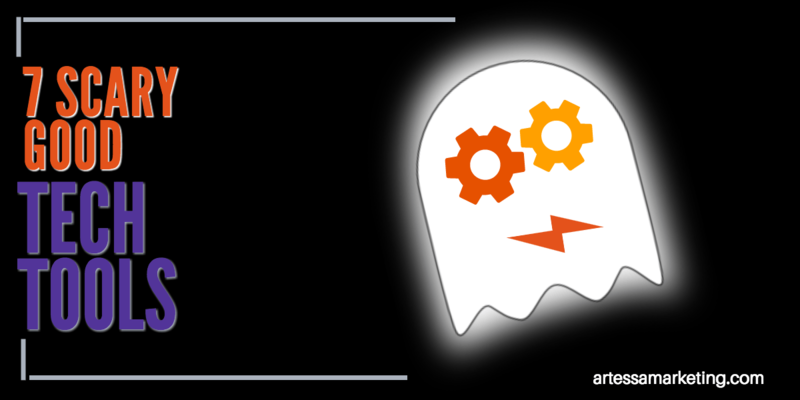 Haunted by the ghost of technology past? Try these tech tools fto make your next content project easy. Smart content creators know that it isn’t enough to simply put out a lot of content. You need great content to produce measurable ROI. And if you’re going to stand out in all the Internet and social media noise, you need to deliver consistent, relevant and shareable content that can be repurposed across multiple distribution channels. Yet, do you find your content marketing process getting bogged down by too many tech tools? Here’s the problem. Content creation takes a lot of time and resources. And, if you’re a small to medium-sized business, the content creation process can be daunting (and costly). You can’t afford to waste time on tools that don’t work. I’ve got the same content creation challenges as you do. I need tools and technology (free and affordable) that not only help me automate my business and processes, but also deliver standout, professional results. Like you, I’m always on the lookout for the best content creation tools to maximize my productivity and make my content creation process easier and faster. I also happen to be a bit of a #techgeek and #earlyadopter when it comes to technology, which is why I created this list of seven lesser-known content creation tools (free and paid) — that help you with everything, from visual design, to research and writing, to analytics and optimization. What is it? Visual Hunt is a terrific tool that helps you find free, high-quality stock photos quickly and easily from one place. The site works by aggregating the best free images from many online sources, so you can browse and search through over 354 million Creative Commons photos. How? The interface is simple. Enter a search term, or browse popular categories. You can even filter image results by color if you’re looking to match a specific mood or palette. Once you find your picture, add the thumbnail to a lightbox at the bottom of the page and download the image — or, embed it directly to your blog or website (using provided code). And search results not only display the image, but also include the image type, source and author. As a word of caution, be sure to check the photo attribution and license requirements. While many photos do allow modifications, others don’t; many also acquire attribution. Why? Visual Hunt is a great place to start if you’re on a tight budget and you need quality pictures for a presentation, blog, website, or social media. While there are certainly typical “stock” images, if you do a little digging, you can find plenty of unusual, stunning and relevant photos that make your project look like you spent a ton of money. Best part? Hands-down, Visual Hunt’s aggregation across multiple sites is a huge time-saver. I can find what I’m looking for (or even additional ideas) in one, easy-to-use (and ad free!) interface. Most pictures are also available in multiple sizes for download. Similar? Visual Hunt is unique because of it’s aggregation, but if you’re looking for free images, you may want to check out Death to Stock, Unsplash (another favorite of mine), Pexels, Picjumbo or Pixabay. What is it? Placeit is a cool mockup generator that lets you create instant mockups for devices, apparel and print (business cards, brochures, car wraps, billboards and packaging). It’s a great alternative and time saver to Photoshop. How? Filter by device, template type (i.e. photo, video, multi-device), or tag. For example, you can get very specific…”I want a mockup of a girl using an iPhone X in landscape mode with a blurry background”. You can upload a photo (or drag one onto the screen) — or even grab a screenshot from a URL. Placeit lets you download a small, unlimited picture with a background for free. But, if you want to download a transparent image or a high/super-high res, unlimited license picture, prices range from $8-$28. Placeit also offers a variety of monthly plans ranging from $12-$199/month. You can also buy image download packs, or build your own combo pack. Why? Placeit is great when you’re in a hurry for a presentation, pitch, or even a quick mockup to show how a design or image might look on a device. It’s great for social media images when you need to brand a device or image easily without Photoshop. A cool feature is to show how a new logo or design might look on clothing or print collateral like a car/van wrap or digital billboard. It’s the ideal tool for occasional users, small businesses or media managers without a big budget for a design/creative team. Best part? You don’t need an expensive or complicated tool to get impressive results. And if you combine your image with another tool like Canva or Snappa.io, you’ll instantly be able to create unique and shareworthy images. With thousands of options and a flexible pricing plan, it’s easy to take your designs to a more personalized, professional and customized level. What is it? Animoto is a cloud-based video creation service that lets you produce videos using photos, video clips and music. The tool allows you to tell your brand’s story by creating marketing videos and video slideshows from your desktop, or via a mobile app. It’s especially useful for creating short, quick-hit videos that help you stand out in social media. How? Animoto includes a variety of pre-built storyboards, which can be personalized by using a variety of fonts and colors. Choose which storyboard to use by its purpose: attract an audience, share a product/service or tell your company’s story. It’s flexible enough to allow you to add and/or delete sections as well. You can even build a video from scratch. Use your photos, videos or music, or choose from an ample library. Animoto recently added new aspect ratios, so you can create videos that are square (1:1) for Instagram or Landscape (16:9) for other uses. Animoto offers a free trial — while you can still download finished videos, they will have a watermark on them. The paid version of Animoto is surprisingly affordable. Monthly subscription plans range from $8-$34/month (paid annually). Why? Video is a great way to boost your site’s SEO. Because there are still fewer video results than there are non-video results, you’ll rank higher for your videos. Just be sure that you include a sitemap entry for your video in your robots.txt file if you’re using it on your website. What’s more, there is data to show that people spend more time on your page if you have video. You can also use video as a call-to-action in email or social media. Lastly, video on landing pages or price pages has been shown to increase conversions because it makes people more comfortable buying and allows customers to envision how they might use the product or service. Best part? Animoto is extremely easy to use, affordable and most of all, flexible. I was able to create a few sample videos in just minutes. You’re also not stuck with templates that don’t fit your business or message. You can customize logos, timing, music and more. And the paid Professional and Business versions give you even more customizable options, including advanced text control, voice-over and an unbranded player page. What is it? Google Trends was originally designed as a tool to help journalists find data about how heavily a topic was being Googled after a major event. Since then, however, it has grown into an especially useful online marketing and research tool that lets you see how often specific keywords, subjects and phrases have been searched over a specific period of time. It helps you discover what matters most to your audience (and why). How? Google Trends is one of the most versatile tools available for SEO. From the homepage, you can explore Trending Stories in real time by category or location. Remember, search results are proportionate to the time and location of each query, so you may want to explore different areas and times. Trending Searches also highlights searches that jumped significantly in traffic among all searches over the past 24 hours. Use it to see what people are most interested in at any given time and how the searches rank compared to one another. You can go as broad or specific as you need to. For example, if I query the term ‘copywriting’, I can drill down into how much interest there has been in copywriting over the past seven days and see that the most interest has been generated in Kansas. I also see that while general copywriting is the most popular topic, copywriting service is the third most popular topic, which means I can do some further investigation to see which service is generating this interest — or, compare how well one topic resonates against another. Cool stuff! Why? Google Trends is a powerful storytelling tool, because it allows us to look at data and trends in real-time. To create powerful (and relevant) content, you need information about the products, events and services that matter most to your target audience. It’s not enough to know how, when and where people search. You need deeper insights that only related searches reveal. For example, why is there a sudden interest in a competitor’s brand name? When does a relevant term spike interest? Google Trends can be your go-to resource if you’re looking to explain — or anticipate — a swing in content demand. Use it to find and create content that your audience is looking for, and more likely to read. What is it? You have this great blog post. And it’s got a beautiful images, visuals, etc. But the headline? Bleh. If you’ve ever wondered how some bloggers seem to come up with just the right post titles, maybe they’re using this Headline Analyzer. The CoSchedule Headline Analyzer is a free tool that rates the quality of your post title and gives you some suggestions on how to make it better. How? Simply enter your headline into the search tool and it will “score” your results and give you suggestions for improvement. I ran my initial headline (7 Scary Good Tech Tools) through the analyzer tool, and it ranked the headline as a mere 62. I could do better, right? The tool recognized my headline as a List, offering a quick analysis of word balance (i.e. common, uncommon, emotional or power words). The Headline Analyzer also looks at overall length and how the headline looks if a reader is “skimming” the content. It takes into account whether or not you are using searchable keywords/phrases and if the headline evokes a neutral, positive or negative sentiment. It goes a step further by showing you how the headline would look in Google Search, as well as an email subject line. Because I knew my initial headline could be stronger, I tried several variations until I settled on the final version above. The final version got a 75 (I generally shoot for anything above a 72) by hitting all of the most important parameters for me (keywords, sentiment, search preview and use of power/emotional words). Why? There are plenty of headline analyzers out there, and this one certainly isn’t going to do anything particularly new or revolutionize your life. But, think of it as a quick way to brainstorm with yourself and generate a list of ideas that can spur additional thinking or better headline combinations. Even if only 2 out of 10 people read a blog post, eight read the headline, so you want to write better blog post headlines that get read by your audience and improve the chance that someones reads through to your article. Best part? If you’re at all competitive (like I am), it’s kind of fun to try to beat your own score. In the process, it really does make you a smarter content marketer. Don’t settle for a good headline. Make it a great headline. Should you trust this tool? Up to a point. I think it’s a great place to start, but remember, you also need to take your overall blog strategy, target audience and end goal into account. What is it? If your potential readers can’t read your content, then it doesn’t matter how great or clever the headline. Or worse, they get frustrated by slow load times, jump ship and you don’t know why. The Google Speed Test, or Page Speed Insights is a handy tool that analyzes the content of a web/landing page on any device (desktop, mobile) and generates suggestions on how to make that page faster. How? It’s super simple to use. Simply type in the URL you want to analyze and it pops back with suggestions and tutorials on how you can fix the page to deliver a better user experience. As a word of caution, many suggestions are pretty technical. If you have any question, it’s helpful to read the linked resource pages and/or get the help of a solid web developer. Why? Today, more people search on mobile devices than on desktops. We spend about 177 minutes on our phones each day. And people are five times more likely to leave a site if it isn’t mobile friendly. Nearly half of all visitors leave a mobile site if the pages don’t load within three seconds! If your site isn’t mobile optimized for speed and performance, you’re likely missing out on connecting with some of your most important potential customers. What is it? Ever wondered what people are doing on your site? Or, you think you have a great landing page, but it’s simply not converting and you have no idea why? Hotjar is a super cool tool that helps you understand how visitors interact with your web and mobile site. It combines analytics with actual, client feedback by letting you grab snapshots and record users live as they interact with your website. It also allows you to manage heat maps, funnels, forms, polls and surveys. How? Hotjar offers multiple tiers and pricing options based on your number of site visitors. Basic is free and works for sites with less than 2K page views per day (allows for up to 100 recordings at a time). Plus is for low traffic sites and early stage start-ups (up to 10K views per day and you can still manage an unlimited number of items with 6 months of data storage). The Business plan is for small/medium businesses; you can pick your price on a sliding scale that allows anywhere from 20K-400K pageviews per day. Set up is super simple. Each account gets a unique Hotjar site code that you add to the <header> code of your site. It works out of the box on most platforms. It took less than a minute to install and verify on my WordPress site, and within minutes, I was watching my first recording as a visitor navigated through my home page and about page for about six minutes. It is absolutely fascinating to watch! Why? Most websites don’t work hard enough, but you’re only guessing as to why that is. This is a tech tool that gives you a shortut into understanding what’s working and not working so you can make the changes that create better results and conversions. Hotjar lets you “stalk” your site visitors without being creepy or intrusive. You’ll better understand what users want, care about and how they interact with your site. You’ll quickly see patterns on what’s working and not working. By watching the recordings, you’ll identify usability issues as real visitors click, tap, move their cursor, type and navigate across pages. The form analysis is also a terrific tool to help discover when and why visitors abandon your forms. Best part? It’s an affordable (especially the free version) all-in-one tool that replaces disparate systems that do just one thing (like ClickTale, Survey Monkey, Crazy Egg, etc.). Not sure which tech tool to use for your content? I can help! Rent my brain. We're always looking for designers, developers and other strategists to make our client work stronger. © 2017 Artessa Communications, LLC All rights reserved.